Like so many of the streets, landmarks and buildings that dot that rise of land stretching from Waterloo Bridge down to Charing Cross Station on the northern bank of the Thames, the Savoy Hotel takes its name from Savoy Palace. Built in 1246 by Count Peter of Savoy, the palace became part of the estate of Henry II who rented it to his wife’s uncle for the extraordinary sum of three barbed arrows. Later, it was home to John of Gaunt, patron of Geoffrey Chaucer, and later still to the Earls of Lancaster. Finally, during the Peasants’ Revolt of 1381, Savoy Palace was burned to the ground. In 1505 the building was resurrected. It functioned as a hospital until the 1820s when it was demolished to make way for Waterloo Bridge. The Savoy Chapel was the only part of Count Peter’s palace to survive the conflagration, the rebuild and the demolition. It still stands today in Savoy Street. The Savoy Hotel was built in 1889 by the great theatrical impresario Richard D’Oyly Carte. The building was funded from the profits of the neighbouring Savoy theatre, established in 1881 to stage Carte’s productions of Gilbert and Sullivan light operas. The 19th century Savoy hotel rivalled the world’s most innovative and luxurious. It was a dizzying nine stories high, was made of artificial stone and had hitherto unheard of horizontal windows. It was one of the first hotels in the world to introduce the ensuite bathroom and full electrical lighting. The Savoy opened with Cesar Ritz (who later went on to found the Ritz Hotel in Picadilly) as manager and Auguste Escoffier, the legendary Frenchman, as Chef. Over the years, the Savoy has been a popular haunt of the royal, the rich and the famous. It has hosted many great parties, like HG Wells’ spectacular 70th birthday party in October, 1936. The ultra chic and ambient American Bar has feted the opening and closing of countless theatrical shows. The vast River Restaurant, a sea of white-clothed tables, sparkling with crystal and silver, has seen innumerable celebratory dinners. The Savoy bedrooms have hosted many celebrities. They have also witnessed their share of scandal likeOscar Wilde’s affair with Lord Alfred Douglas which took place in Room 346. The Savoy’s outlook, across the Victoria Embankment over the river, is spectacular and Monet’s impressionist painting, the Thames, shows the the view from a third floor window. In November, 2007, the tinkling piano in the American Bar fell silent. Much of the furniture, along with the china, the crystal, the cutlery and the linen fell under the auctioneer’s hammer. The doors to the Savoy closed, a shroud of scaffolding was thrown around its artificial stone walls and a lengthy programme of renovation and refurbishment began. Fans and frequenters of the Savoy were left wondering what to expect. Had the Savoy as we all knew it and loved it gone for good? Would those wide sweeping staircases remain? Would that grand dining room, with its windows onto the gardens? Had the American Bar vanished forever? Or would it all be back, the same as it was, but newer, fresher and better, to face the next century? 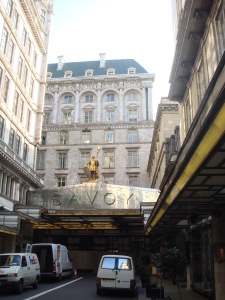 In October 2010 the Savoy re-opened. The new foyer (The Thames!) houses a winter garden gazebo, under a stained-glass cupola, which is the venue for both dinner and high tea. There’s a teashop and patisserie (Savoy Tea) and a glass-walled gym with rooftop swimming pool, above the Savoy Theatre. The new black and gold Art Deco Beaufort Bar offers nightly cabaret. The erstwhile River Restaurant, now Kaspar’s, is also decked out in the art deco style. The American Bar (thank goodness) remains almost untouched. The famous Savoy Grill, now relieved of its Michelin Star, is managed by none other than Gordon Ramsay. There are seven private dining rooms all named after Gilbert and Sullivan Operas. The bedrooms on the Thames side sport Edwardian decor, while on the Strand side it’s Art Deco all the way..
An interesting addition to the new Savoy is the small museum, next to the American Bar, with a revolving exhibition of items from the hotel’s archives. The hotel also now offers a champagne river tour, by motor launch departing from the Savoy Pier in front of the hotel and taking in historic spots both upstream and down. But even so, business is not brisk at the new Savoy and a cloud hangs over its future.